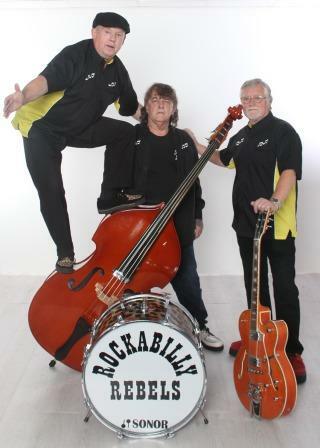 Rockabilly Rebels are a professional Rock n Roll / Rockabilly Trio comprised of amazing musicians, with decades of experience between them. With Steve Lloyd (previously of Mungo Jerry), along with fellow Applejacks band member John Partridge, on Drums & Lead Guitar respectively; & David Roberts (previously with the Bill Haley Tribute band: Phil Haley & his Comments) on Double Bass, & with all three singing vocals. These three veterans of music will bring the Spirit of the American South to any event! They are fully self contained, with all their equipment being PAT tested, & have full Public Liability Insurance.